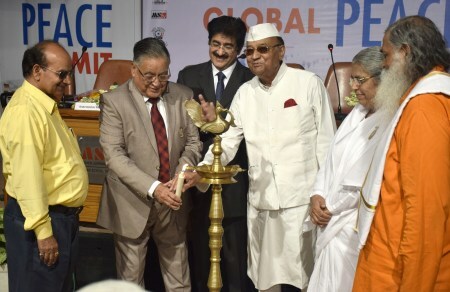 Noida: The Global Peace Summit planned by World Peace Development And Research Foundation of Marwah Studio was one of the most successful step ever taken by the private organization in the country. The curtain raiser was organized few days earlier, which has 29 delegates from 12 countries. This time 60 delegates participated from 30 countries of the World including government officers, chambers, media persons and people from all strata of life. â€œNo War Means Peace. Emphasis on brotherhood, and feeling for mankind will bring all countries close to each other,â€ said H.E. Gen K.M. Seth former Governor of Chhattisgarh while inaugurating the Peace Conference. â€œDeveloping business relations and economies will not let you hate each other, people of other countries will have more respect for each otherâ€ said H.E. Syed Sibtey Razi former Governor of Jharkhand. â€œLove And Emotions can win the World. Start developing peace within you. You will be more calm and sharp,â€ added H.H. Brahm Kumari Ashalata Director of Brahm Kumari a spiritual organization. â€œWe are son and daughters of the same almighty, why need to fight and destroy mankind for no rhyme and reasons â€œ from Jaipur. â€œEducation plays a very important role in understanding each other motives and purposes. Inter ration exercises, meets, summits, conclaves will bring people of different countries togetherâ€ said Dr. Rishi Raj Singh Director NIESBUD, Ministry of Skill Development. â€œWe have always believed that World is one family, one place to live and one Godâ€ said Sandeep Marwah who introduced the concept of Peace to the delegates from 30 countries of the World including Russia, Bahrain, Malawi, Niger, Nigeria, Sudan, Uganda, Tanzania, Nepal, Myanmar, Ukraine, Sri Lanka and Mauritius. Later Sandeep Marwah President of World Peace Development And Research Foundation presented life membership of foundation to the dignities. The event was well attended by film, television and media persons also.